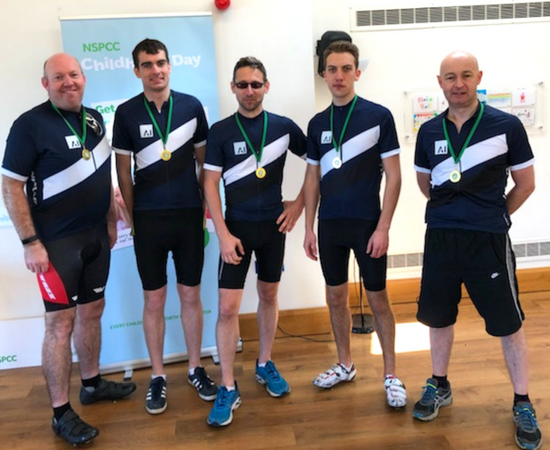 On Saturday Team AI’s budding cyclists took part in the gruelling SQS Tech Team Cycle challenge to raise money for the NSPCC. This year’s event, which had the option of taking on either the 80km or a new 40km route, follows on from the highly successful challenges held in 2016 and 2017, which saw over 20 teams from the thriving tech sector in Northern Ireland take on the challenge. The race began in Ballygally, where cyclists flew past a scenic coastal stretch before tackling some challenging climbs and testing sprints. Racing for Team AI was Simon Cole, Kyle Bingham, Patrick Watters and Paul Hudson and accompanying them was Paul’s brother Andrew who flew in from England especially to take part in the race. They cycled valiantly, and although Team AI didn’t quite make the top 10 fastest teams, the day was a fantastic success. The aim of the event is to raise funds for NSPCC, the UK’s leading children’s charity which aims to help prevent child abuse of all kinds. To date, it has raised in excess of £50,000. This staggering amount goes towards helping provide vital care and help to vulnerable children across the UK. Overall, the event was a massive success thanks to everyone involved in organising and taking part. We’re sure that Team AI will be ready for whatever the SQS Tech Team Cycle Challenge has to offer at next year’s event too.